If you have ever wanted to be able to make delicious bread at home then you might want to consider purchasing the Sunbeam 5891 2-Pound Programmable Breadmaker. With just a touch of a button you can start making bread of multiple variants using the 12 cooking functions that this unit provides. The 13-hour delay bake cycle means that you can have fresh bread cooked for a specific time in the future, such as when you up, or when you reach home after a day of work. If you are in a rush you can have bread made for you in less than one hour using the ExpressBake cycle. Cleaning up after you have finished is easy due to its non-stick removable baking pan. Because the Sunbeam 5891 is one of the most affordable and simple bread makers on the market it has received a few negative reviews from customers, who have expected the product to have more capabilities. One of the most common criticisms of this bread machine is for the recipes that come included with the unit. The reviewers have found that the suggestions in the booklet incorrectly advise the user to use more yeast than is required. These recommendations have led to a number of ‘fallen’ loaves. A lot of the users of the product have suggested that this problem can be avoided by simply investing in a good bread maker recipe book. One that is highly regarded is called the Big Book of Bread Machine Recipes. Some users have stressed the importance of correct measuring and taking the time to ensure that your preparation is done appropriately. This will increase the quality of your bread and overcome some inconsistent results that a few reviewers have experienced. One unpopular feature of the product is its LCD screen. Apparently, it can be quite hard to read in a bright kitchen, which is something you may wish to consider before purchasing. With over 2040 reviews (at the time of writing), and 4.2 stars, the Sunbeam 5891 has obviously received a lot of positive feedback from its customers. The low price of the machine has definitely pleased the reviewers. With some bread makers costing over $200 this is definitely an affordable option. If you have never purchased one before then this will make an inexpensive introduction for you to the art of bread making. The customer feedback suggests that it is also very easy to use and will require minimal effort on your part to create a delicious loaf of bread. All that is required is for you to place the ingredients in – you will be enjoying fresh bread in about three hours. Another great benefit of this product is that the clean up required is negligible. The unit is also well built and sturdy. Most importantly, customers have been pleased to report that the machine offers consistent results over a variety of different bread types and that they are very happy with the taste of the bread that is produced. Would we recommend the Sunbeam 5891 to our readers? 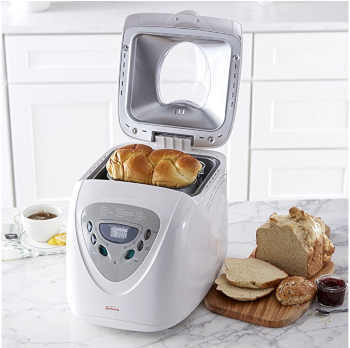 While this bread maker isn’t the most advanced product on the market, we think that it represents a great value deal because it is so affordable. We are confident in recommending this product to those of our readers who wish they could experience wonderfully fresh bread at home without having to spend a lot of time cleaning up after themselves. At the price that it is offered we think that it’s a great way to enter the world of bread making for only a small investment. However, remember that you may wish to purchase a recipe book to make sure that all of your loaves come out of the machine perfectly. Check out the Sunbeam 5891 at the best price available through Amazon.com or to read through the customer reviews in greater detail so that you can make a more informed buying decision.